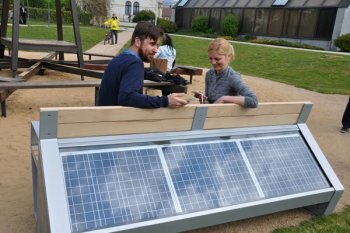 Energy manager Jaroslav Klusák and Full CapaCity project manager Jitka Nesrstová were the first to test the smart solar bench. Litoměřice is the first Czech city to provide its citizens with a smart solar bench. ‘CapaSitty’ was recently installed in the Václav Havel public park. Sustainable energy is one of the main development priorities for this Litoměřice. The solar bench is part of an integrated action plan for energy conservation and renewable energy. Its aim is to promote the use of solar energy in public spaces. The CapaSitty bench was developed by the ‘Full CapaCity Company’ in cooperation with designer Jan Vitek and experts from the Czech Technical University in Prague. Jaroslav Klusák, energy manager of Litoměřice, has quickly been convinced: "This is the first ‘smart’ bench designed not only to rest. It is also offering free internet access and charging station for mobile phones, tablet PCs or cameras, and all this by only using solar energy! Furthermore, the bench monitors energy production and consumption as well as air quality". The bench provides a charging device with a USB socket and offers charging via induction for the phones that support wireless charging. It has a built-in battery, which makes the system works even when the sun does not shine. The bench is 2.2 meters wide and 1 meter tall, it weighs approximately 350 kilograms and is made of steel, concrete and wood. The solar panel is located behind the backrest. The municipality bought the bench in the framework of the "READY 21" project financed by the Swiss - Czech cooperation programme. "Due to its functionality, the bench is a perfect tool to raise citizens’ awareness and promote our sustainable energy policies", said Mayor Ladislav Chlupáč. The company is now ready for mass production and is negotiating with several interested parties and partners for distribution in the Czech Republic and abroad. See more information on Litoměřice as a POCACITO case study city.